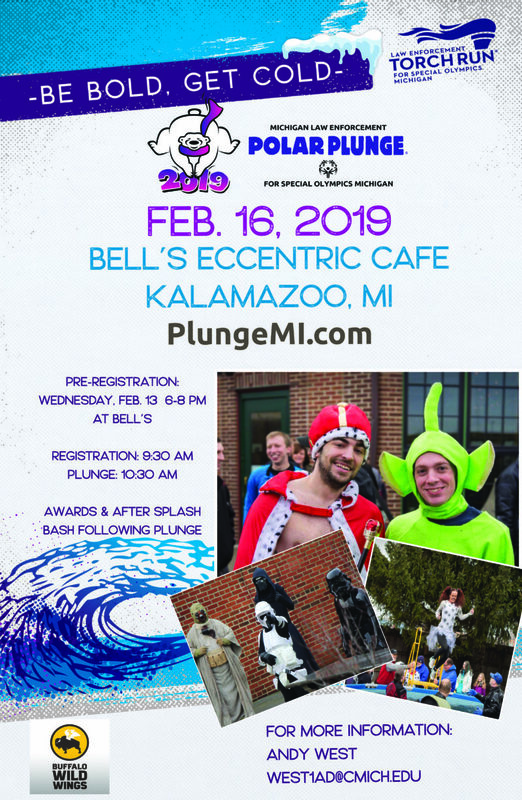 The Kalamazoo and Calhoun Plunge takes place February 16, 2019 at Bell's Eccentric Cafe. Pre-Registration night Wednesday, February 13, 2019 at Bell's Eccentric Cafe, 6 - 8 pm. Stick around for awards at the After Splash Bash immediately after the last plunger. Michigan will be having 30 Polar Plunges in 2019. Polar Plunges are a Law Enforcement Torch Run (LETR) event. LETR is one of the largest grassroots fundraisers for Special Olympics globally. LETR consists of officers from both Law Enforcement and Corrections who raise funds and create awareness for SOMI year round. By participating in a Polar Plunge around the state you are helping to raise funds for over 27,000 athletes who participate in Special Olympics Michigan. Special Olympics Michigan is a year round program offering sports for those with intellectual disabilities. Although sports are the "vehicle," the ultimate goal of Special Olympics is to help persons with intellectual disabilities participate and receive respect as members of their communities.